I was going through my collection of digital photos and realized that I haven’t shared the photos from our road trips along the ‘Tail of the Dragon’ yet. 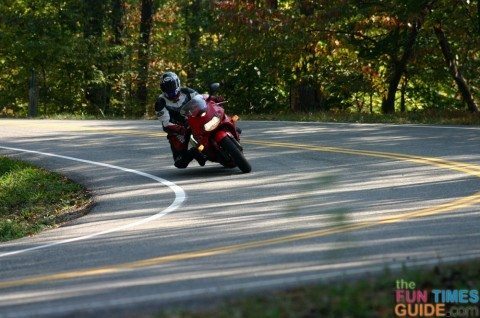 The Tail of the Dragon at Deals Gap, with 318 curves in 11 miles, is America’s number one motorcycle and sports car road. 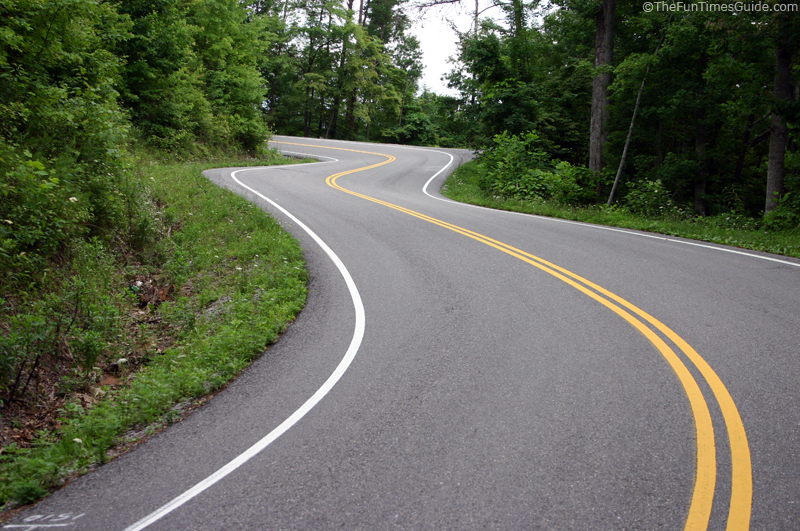 It’s definitely a daredevil stretch of roadway. 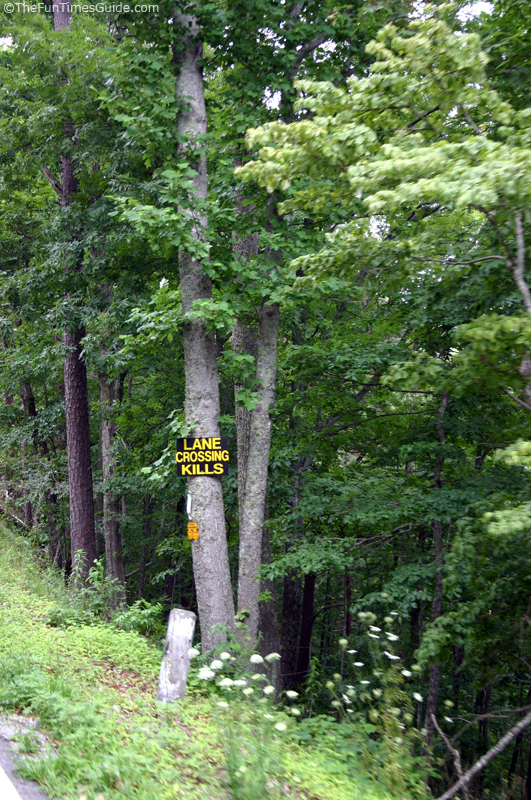 (For example, check out these Tree of Shame photos!) But that’s not why we go there. We go there for the scenic views and a fun ride in the Jeep with the top down. 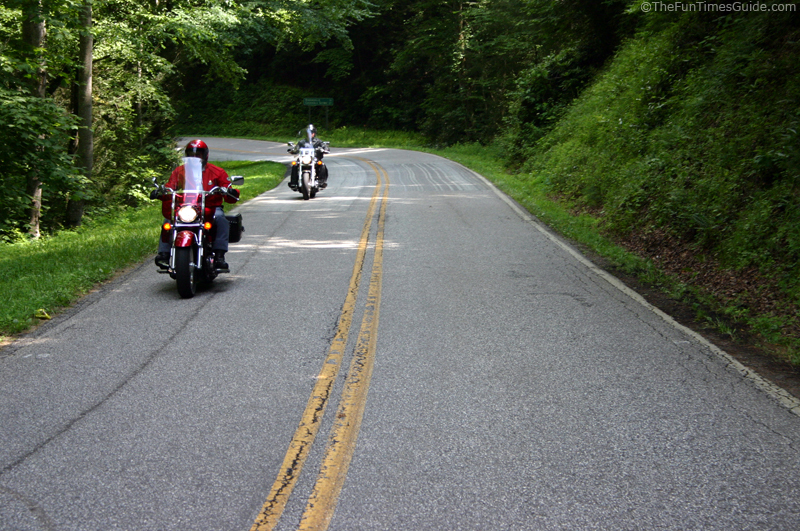 I’m sure the motorcyclists hate us for that, because we just get in their way when they’re trying to take the rapid turns… fast! While we’re not the only car on the road… vehicles other than motorcycles are definitely in the minority. 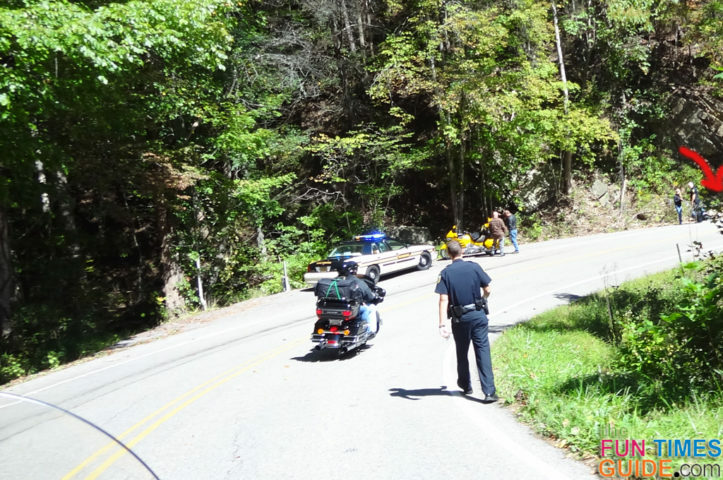 That said, there have been a bunch of fatal wrecks on this particular road, and I remember reading that most (if not ALL) of the deaths occurred while the drivers were headed NORTHbound on Highway 129. Hmmmm…. 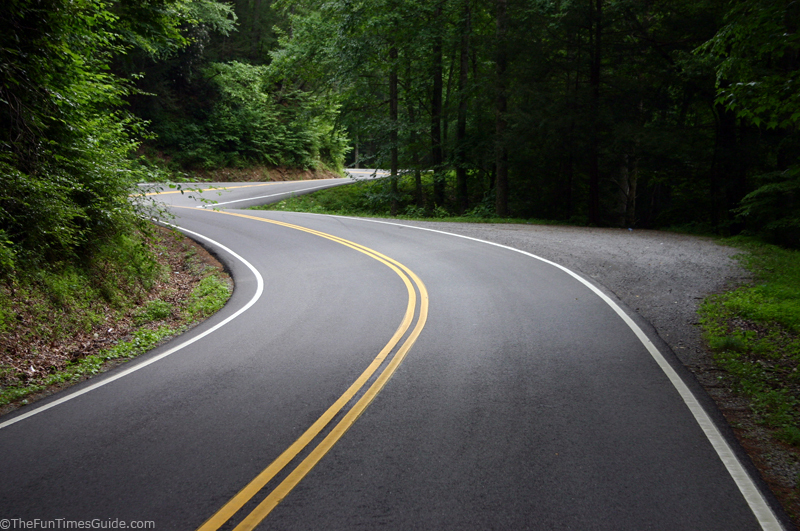 For the most part, what makes this road unique is the number of sharp (very sharp!) 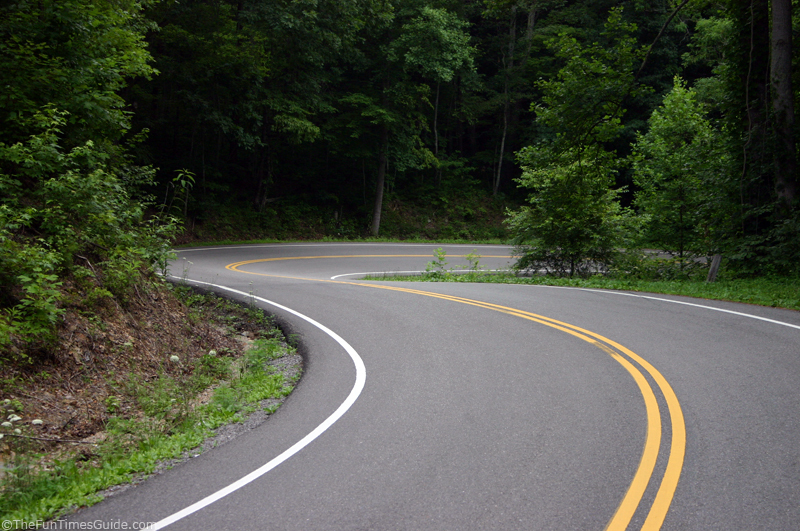 turns within a very short stretch of roadway. They say the Tail of the Dragon is like a roller coaster ride — but better — because you are in full control behind the wheel. 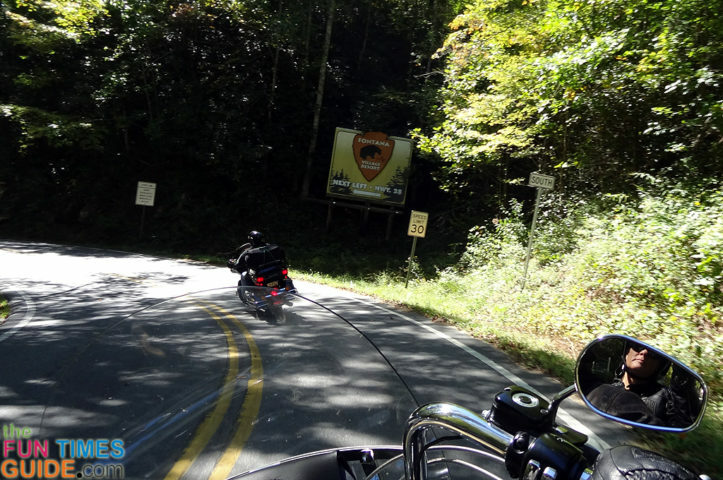 Whenever we go out to ride along the Tail of the Dragon, it’s usually because we’re in a bit of a funk, and we’re just dying to run wild in some new territory. Driving Directions — how to get there from anywhere! 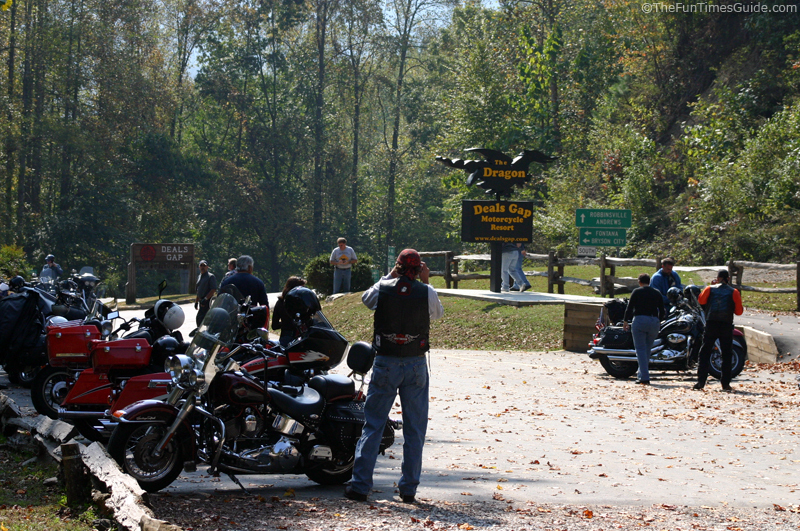 Current News & Updates — see what’s happening at Deal’s Gap and Dragon’s Tail year round. Big Trucks Prohibited On The Dragon — while the North Carolina side of the Dragon has banned trucks larger than 30 feet for years, the Tennessee side just recently instituted a ban on big trucks. Fasten your seat belt (or your chinstrap, if you’re on a motorcycle! ), and take a couple of Dramamine tabs first because you are about to go on one LONG and TWISTY ride! 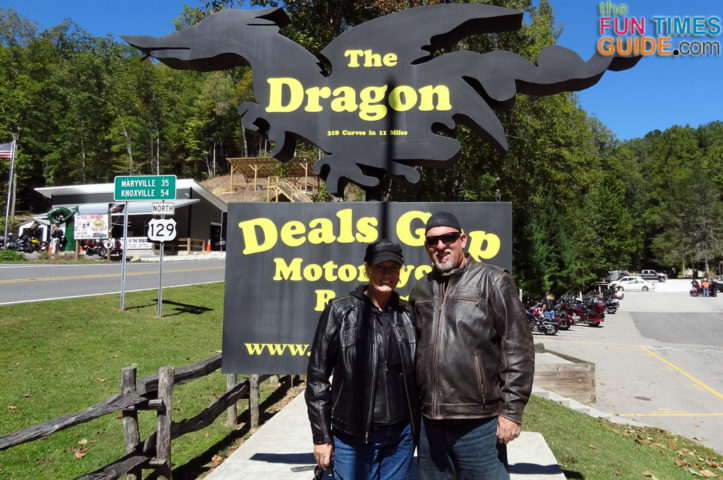 Follow along the entire 11 mile journey called The Dragon — beginning at Deals Gap and ending at the Dragon’s Tail, including all 318 curves in between! 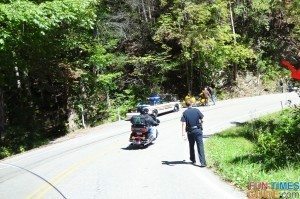 We post Tail of the Dragon updates, videos, and photos on our fun Motorcycling Board on Pinterest. 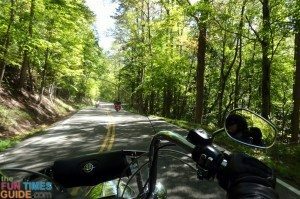 And if you’re into motorcycling — as well as jeeping — then you’ll enjoy our articles about fun Motorcycling Tips & Adventures as well.